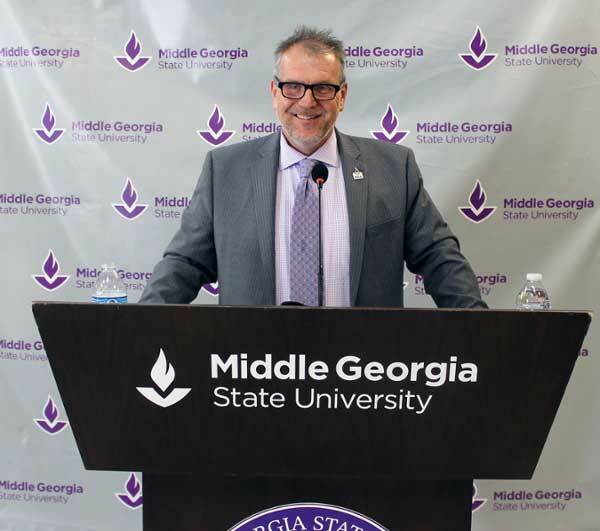 With growing enrollment, an increasing number of graduates, and degree program expansion, Middle Georgia State University is stronger than ever just six years after the consolidation of two regional colleges created the five-campus institution. At his 2019 “State of the University” address, given at Middle Georgia State’s Dublin Campus on Thursday, Jan. 24, President Dr. Christopher Blake gave the institution an “A” grade on a variety of measureable goals and strategies. What is now Middle Georgia State University (MGA) was created by the Board of Regents of the University System of Georgia in January 2013 with the consolidation of Middle Georgia College and Macon State College. The new institution covers a wide geographic range, with campuses in Macon, Cochran, Dublin, Eastman, and Warner Robins. The University is made up of the College of Arts and Sciences and schools of Aviation, Business, Education & Behavioral Sciences, Health Sciences, and Information Technology. MGA is the only public university in Georgia with a School of Aviation, based on the Eastman Campus, and offers one of the few residential programs in the state for dually enrolled high school students. • The University has graduated 1,300 students this academic year, the second highest since consolidation. The majority of MGA graduates reside within 75 miles of the Warner Robins Campus, an important measure of economic impact on the region. MGA has a regional economic impact of $250 million, according to recent assessments. • Enrollment, both in headcount and credit-hour production, grew by 6 percentage points in fall 2108, the second highest percentage growth in the University System. Fall 2018 enrollment hit about 7,800 students, the largest enrollment since 2014. • Enrollment for the current semester, spring 2019, beat MGA’s target goal and represents the third consecutive semester of enrollment growth. “Three is not a blip, it is a trend,” Blake said. • The number of students living on MGA’s campuses increased by more than 15 percent in fall 2018. A new residential hall, housing 300 students, is on track to open on the Macon Campus in 2020. Meanwhile, MGA is serving a growing number of students online, offering degree programs that can be earned partially or fully online. • Nearly 700 students, a record number, are pursuing research opportunities with faculty mentors. • MGA launched a comprehensive strategic plan called “Elevating Middle Georgia” in summer 2018 that calls for “purposeful” enrollment, clear student success, and sharing of a built culture. The plan drives the University’s overall vision. • A new level of collaboration between MGA’s academic and enrollment operations has been a game changer, the president said. Working more closely together helps the University not only enroll more students, but helps ensure that more of them make ongoing progress toward their degrees and graduate within a reasonable amount of time. • More private dollars to support the work of MGA are growing through fundraising campaigns conducted through Middle Georgia State University Foundation. The 2018 “Annual Fund” campaign exceeded its goal of $875,000, and a more comprehensive and longer-term “Greatness Campaign” is underway. • MGA’s strong reputation and brand reputation is catching the attention of those in the region as well as the state. MGA is aiming to increase the presence of its aviation programs and is well on the way as the School of Aviation is one of only eight schools nationwide recently selected to participate in the Delta Propel program to train more pilots for the airline. The real measure of MGA’s work, Blake said, is the students. Read the full text of Blake’s “State of the University” address at https://www.mga.edu/president/state-of-the-university.php.